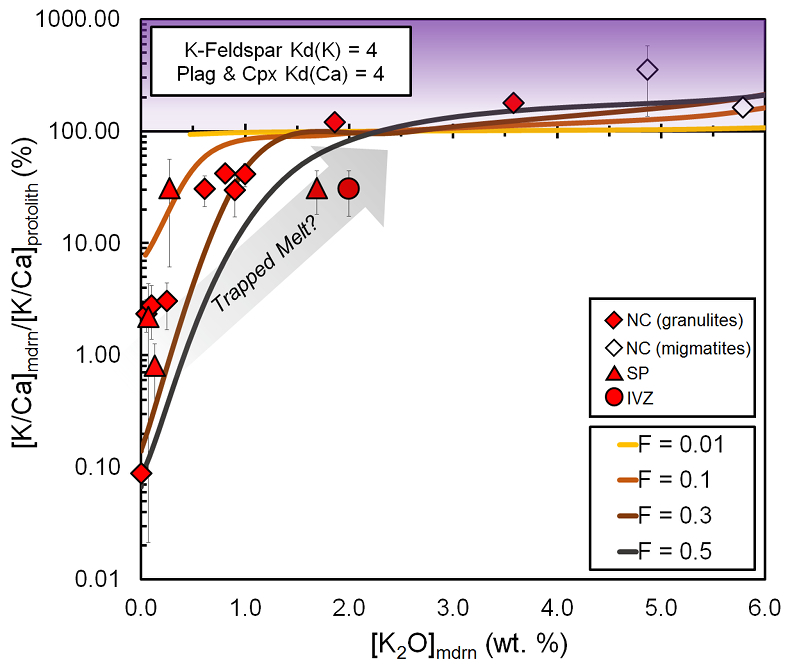 Antonelli, M.A., DePaolo, D.J., Chacko, T., Grew, E.S., Rubatto, D. (2019) Radiogenic Ca isotopes confirm post-formation K depletion of lower crust. 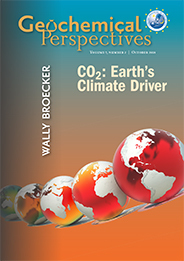 Geochem. Persp. Let. 9, 43–48. U.S. National Science Foundation (NSF) (primary funding); Natural Sciences and Engineering Research Council (NSERC) of Canada. 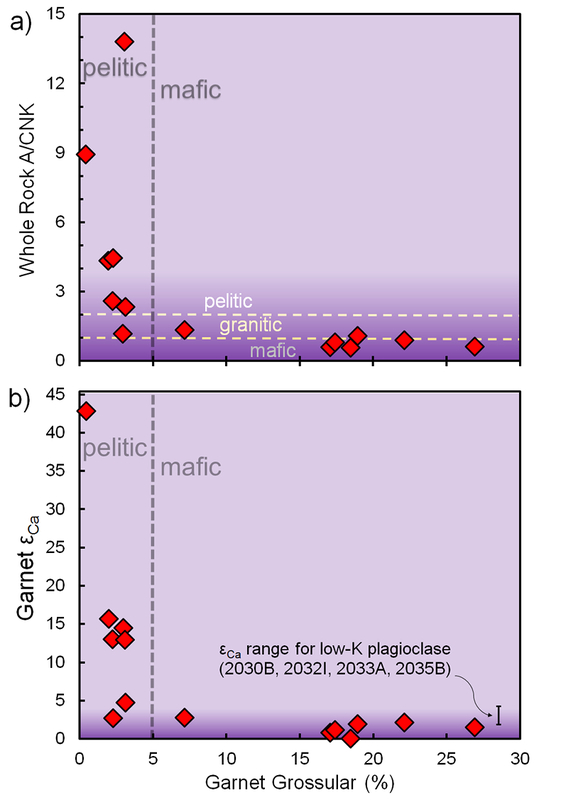 Figure 1 Garnet grossular content versus (a) whole rock peraluminosity index (A/CNK) and (b) garnet εCa values (for samples containing garnet, n = 14). 2σ uncertainties (±1 for εCa) are smaller than the symbols. Approximate mafic, granitic, and pelitic compositional zones are separated by dashed lines (SI). Darker purple band in (b) represents Bulk Silicate Earth (εCa = 0) composition, corresponding to 40Ca/44Ca = 47.156 (SI). 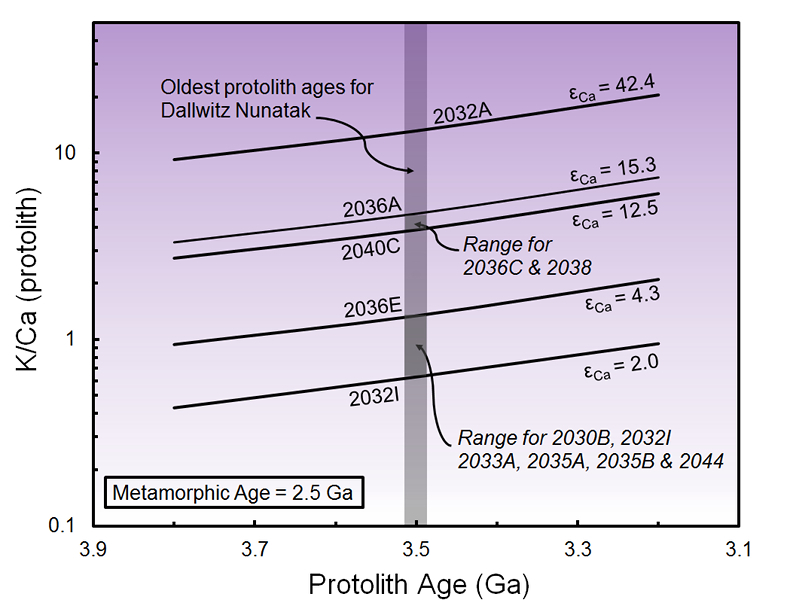 Figure 2 Dependence of [K/Ca]protolith on protolith age for samples from Dallwitz Nunatak (NC, n = 12) based on Equation 2. Curves are labelled by sample and delineate constant values for initial εCa at 2.5 Ga with varying protolith ages. Grey band demarcates oldest protolith age found at Dallwitz Nunatak, in the northern Napier Complex (SI). Figure 3 Whole rock K/Ca (modern) versus K/Ca (protolith) based on εCa [Equation 2]. NC granulites (n = 10), NC migmatites (n = 2), SP (n = 4), IVZ (n = 3). Contours indicate relative K-loss (in %) assuming constant Ca. Uncertainties in protolith K/Ca are calculated using Equation 2, using our 2 sd on εCa (±1); arrow terminations represent samples within error of BSE. Protolith-metamorphic ages: 3.5-2.5 Ga (NC); 3.0-2.5 Ga (SP); and 0.6-0.3 Ga (IVZ) (SI). Uncertainties for modern K/Ca are <~5 %. 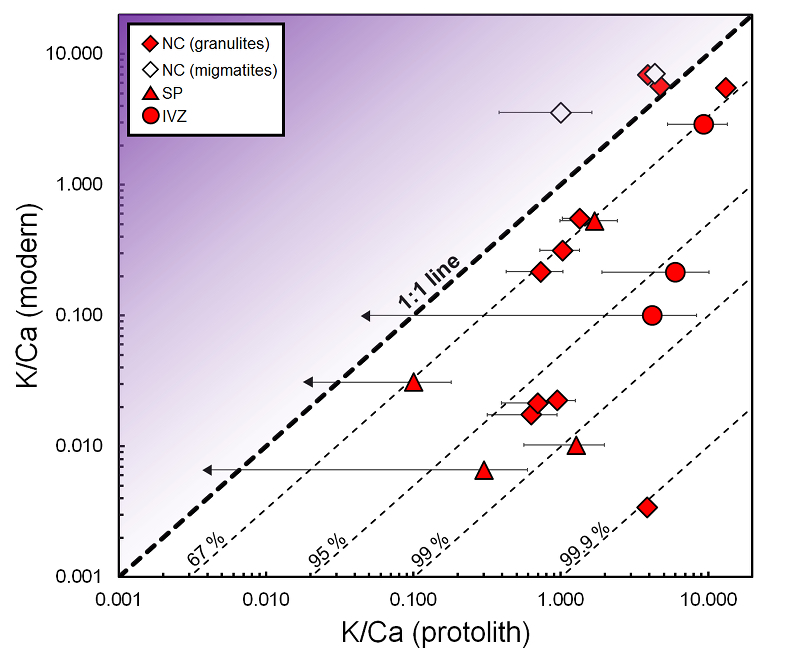 Figure 4 εCa–based [K/Ca]mdrn/[K/Ca]protolith [Equation 2] versus measured [K2O]mdrn (excluding amphibolites and eclogites). Predictions from our melting model [Equations S-2 through S-4], for various starting compositions (same as in Fig. S-5) varying degree of partial melting (F) (coloured lines). NC granulites (n = 10), NC migmatites (n = 2), SP (n = 4), IVZ (IV-16-24, n = 1). Vertical error bars calculated using Equation 2, combining with those from XRF (<~5 % for K2O/CaO); horizontal error bars are smaller than the symbols. Arrow shows effect of trapped melt on residual solids. 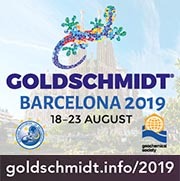 Samples plotting above 100 % are consistent with model predictions for high K/Ca protoliths, but petrographic evidence (see SM) suggests that these potential enrichments result from (externally derived) trapped melt.